Workshop speakers, staff and fellows gather for a group photo on April 12. The Midwest Center for Investigative Reporting's "Covering the U.S. Visa System in Your Own Backyard" workshop was help April 10 through 12 at Columbia College in Chicago. Brant Houston, Knight Chair in enterprise and investigative reporting at the University of Illinois at Urbana-Champaign, opened a Midwest Center for Investigative Reporting workshop on April 11 by noting its sessions would cover the bleak side of visas. During the "Lightning talks" workshop session on April 11, fellows heard personal experiences on the visa system. The Diversity Visa Program: The program is a lottery to get into the United States that admits 55,000 people per year. McGraw discussed how employee visas tied to the employer, such as E2 visas, leave the door open for employer abuse and fear of reporting any employer abuse. For more on the workshop, visit the series page: "Investigate Visas"
Filipino workers recruited with false promises of doubling or even quadrupling their pay at L’Amande French Bakery, filed a lawsuit against the bakery in March. In addition to working 17-hour work days for the bakery for less than minimum wage, the workers said they had to do construction projects, cleaning and landscaping for the bakery owners for slightly more than $2 an hour. McGraw said, additionally, visas allow for human trafficking victims to come into the country completely legally. McGraw said, although these programs are riddled with abuses, Congress still allows for thousands of visas to be issued in under-regulated programs every year. It even blocked efforts to protect program abuses. 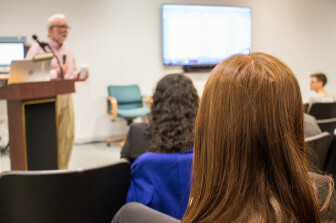 A workshop fellow listens to veteran reporter Mike McGraw talk about his visa-reporting experience on April 11. To further complicate things, as many as four federal agencies – the U.S. Department of Labor, the Department of Homeland Security, the Department of State and the Department of Justice – are involved in regulating the visa process and there is no evidence that they all work together. Wrapping up the session, Houston said it was key to approach investigations incrementally over time.